Lyon's Chinatown is not very large, as I mentioned way back when I first discovered (to my relief) that I would have a steady source of Sriracha sauce, spicy udon and pho noodle joints. It's not especially picturesque, as it's in a run-down graffiti-stained neighborhood wedged between the Arab district of the 3rd arrondissement and the student ghetto close to Université Lyon I. There's no decorative gate a la San Francisco, no Buddhist temples that I know of, no faux-chinois architecture. Still, I go there about once a week on the odd ingredient run or for a huge bowl of pho and a cold Singha (€7.50, quite a bargain for a sit-down meal in Lyon). This Chinatown also qualifies as the real deal thanks to its Chinese New Year celebration. 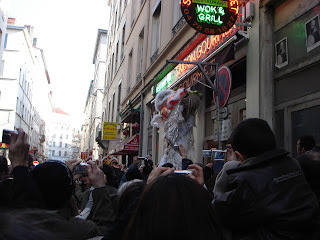 On the New Year, a team of lion dancers [photo 1] accompanied by a rough-but-tireless-and-enthusiastic percussion section [photo 2] makes its way through the neighborhood, stopping at each store and restaurant. 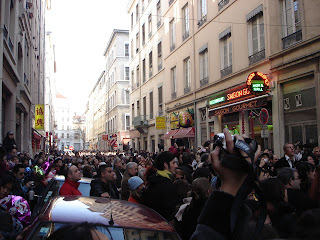 The streets here are narrow and crowd control for the event nonexistent, and with throngs of people [photo 3] it's every man for himself to get a good view of the goings-on. We went this year for the first time, not having known the wheres and whens last year. We had Tater in his stroller (as I can't sling him since I blew out my back a few weeks ago), which proved to be a challenge. 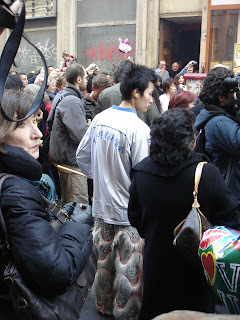 Incredibly, he managed to fall asleep amidst the crowd and the firecrackers and the drumming and general chaos. The pattern is the same at each establishment: The lions and drummers dance/march/frolic down the street very slowly with the aid of a team of handlers carrying long poles to maintain some sort of perimeter. 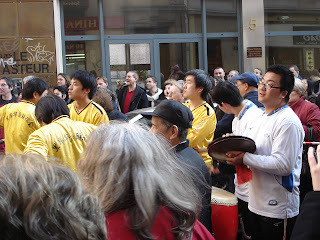 The lions stop in front of an open establishment and do their lion dance thing as the percussion section raises a clangorous racket to chase away evil spirits. Then someone says a few words (impossible to hear over the noise), and huge strings of firecrackers are touched off by someone of importance. 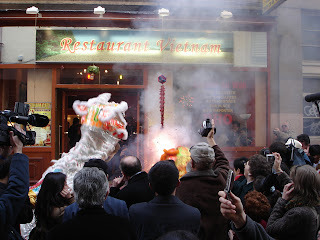 In this case [photo 4] the celebrant is Lyon mayor Gérard Collomb [man with bald spot plugging one ear, just to right of white lion] the narrow streets booming with the echoes of the reports. 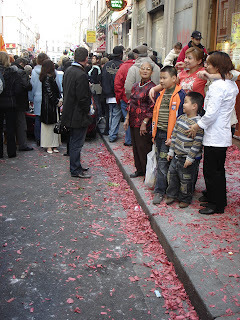 The red paper wrappers of the firecrackers fill the air like confetti and drift to the sidewalks like red snow [photo 5, family portrait in front of (presumably) the family restaurant]. Then the lions get to work, entering the establishment and rousting any evil spirits left hanging around, dancing through kitchens or down the packaged-dried-squid aisle. I couldn't get anywhere near while this was happening due to the massive chokepoint of people at the doorway, so I can offer no further insight here. 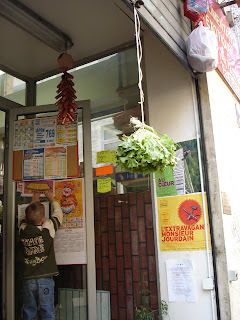 Having done their work, the lions are rewarded by a gift of sustenance: a bundle of lettuce and green onions hung over the doorway beforehand [photo 6, entrance to Supermarché China Express, "my" Asian grocery]. 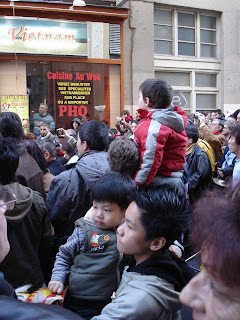 The lions take turns climbing up to "eat" the lettuce [photo 7] as the crowd applauds and kids look on [photo 8]. 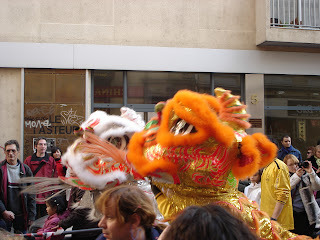 Then there is some sleight of hand (or foot) as weary lion dancers are substituted out and fresh legs take their place [photo 9, dancer with lion pants. Do they get to keep those year-round? Cause I'd wear mine all the time]. The procession, um, proceeds to the next establishment and new waves of spectators elbow to the front as others drift back through the crowd. And the cycle repeats-- all afternoon. After a few cycles, we take our leave; the crowd has moved on, and we need to pick up some extra-firm tofu, lemongrass, and tomyum-coated peanuts. Eh bien, Gung Xi Fa Choi, y'all. Just to satisfy an intellectual itch, do the French refer to an oriental enclave as "China Town" as we do (or the French version of that) or do they have another name perhaps reflecting their colonial past? No, not at all. As far as I can tell there is no comparable term. The area is most often referred to as "La Guillotiere" (the name of the entire neighborhood)or more specifically "le quartier asiatique a la Guillotiere" (the Asian neighborhood at la Guillotiere). Worth noting is that "oriental" means something different here: a "fete orientale" will involve belly dancing rather than lion dancing, and "specialities orientales" are couscous rather than mapo dofu. We found this out the hard way after bursting excitedly into a patisserie orientale to find no moon cakes at all. The French colonial past is reflected mostly in the large Vietnamese cohort in Chinatown (as you can see on the signs in the background of these photos). Mandarin seems to be the lingua franca though.